Hello. Firstly, thank you so much for your kind words about our revamped tiny garden. I'm so pleased you like it too. So, I'm participating in The August Break 2014 this year via Instagram and so far... I'm loving it! 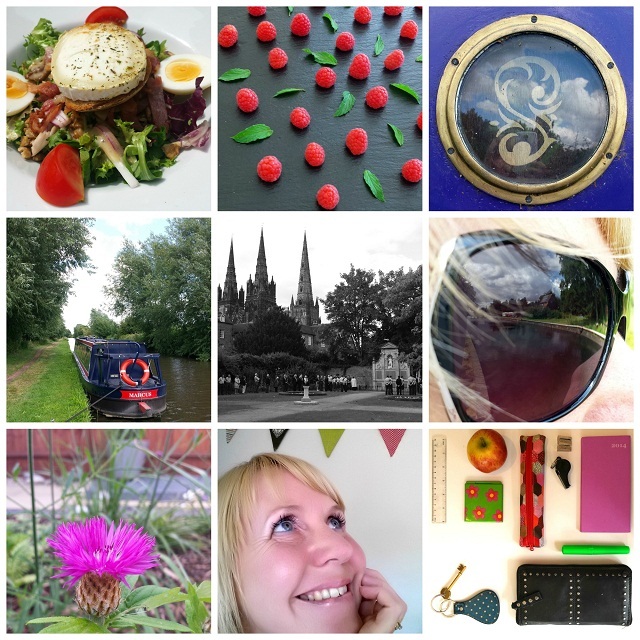 I've managed 10 whole days of following the photo prompts and have discovered a new enthusiasm for photography and a huge admiration for the creativity, positivity and community of all those participating in the project. Also, I managed a half decent selfie and that wouldn't have happened without this project - I'm far too self-conscious to post this sort of photo, normally. It's been quite a discipline recording a photo each day and it has made me reflect not only on my daily life but also on the bigger picture of this huge, diverse and wonderful world we live in. ♥ Lunch. A rare treat - Friday lunch out with hubs at a bistro in Moseley, Birmingham. A lovely break. I had goats cheese salad. Nom, nom. ♥ Pattern. Raspberries and mint, which were later eaten with lemon tart. Again, nom, nom. ♥ Window. I spotted this striking purple barge on one of of our canal side walks. I love canal boats, as you may know. I think I'd like a purple one. ♥ Orange... for the life ring, but this barge also bears our youngest's name, Marcus, so that made me coo. ♥ Three. On Monday I went to a short service to commemorate the anniversary of the start of World War 1. We listened to prayers, poems and Bible readings under the three spires of Lichfield Cathedral. It was very poignant and I then stayed up to watch more on TV and lit candles. Did you? ♥ Reflection. Sunglasses, worn on my regular lunchtime walks. Time to step out and enjoy the day. ♥ Today is... Yes, on Thursday, "tall, purple" decided to bloom in our garden. I still don't know the name of this plant but I like its magenta flowers very much. ♥ Selfie. Seriously, do I have to? Eventually, I submitted. This is me unleashed August 8th 2014. ♥ In my bag. Some tools of my teaching trade. I'm looking forward to the next week of The August Break. Anyone can join in anytime at any level if you're interested. Very inspiring. Your selfie is beautiful, your eyes sparkle. Ditto for everyone else's comments. The selfie is really good. I like how you're not looking at the camera, nor is your arm visibly outstretched, both pet hates in selfies for me. Love Lichfield cathedral. Apart from anything it reminds of my best friend from my childhood who went to live there, so Lichfield = Lynne for me in addition to all its other attractions. Lovely selfie, shows your spirit!